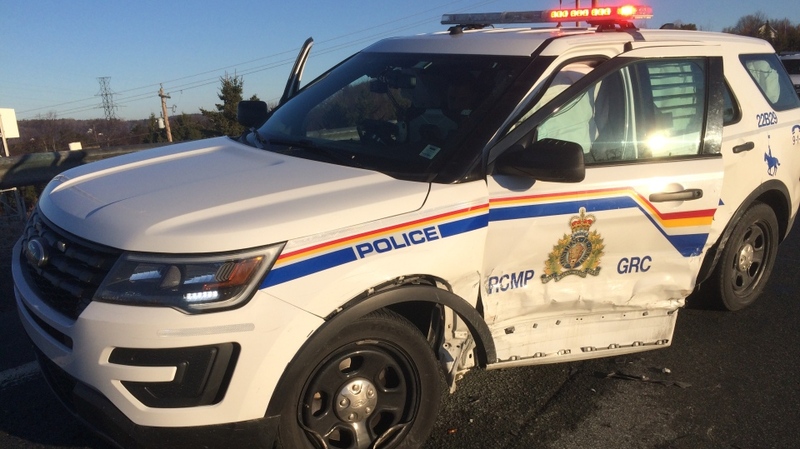 A member of the Halifax District RCMP suffered minor injuries when his SUV was struck from behind while he was stopped on the side of Highway 102 in Fall River on Sunday morning. Police say the Mountie was in his vehicle, which is fully marked and had its emergency lights turned on. Police say the officer was taken to hospital and later released. The driver of the vehicle that struck the police vehicle was assessed by paramedics at the scene and was released at the scene. After the close call over the weekend, RCMP are reminding the public about the move-over law, which came into effect in 2010. Under the law, if you see an emergency vehicle pulled over with its lights flashing, you must slow down to 60 km/h or obey the speed limit if it's lower. If you're on a road with two or more lanes in your direction, you must also move into another lane, if it's safe to do so. In September 2017, RCMP Const. Frank Deschenes was killed while helping a motorist change a tire along a highway in New Brunswick. Some first responders say motorists still aren't following the law, even after the tragedy. In addition to emergency officials, the law also requires people to move over for public safety officers and tow truck drivers. Fines for not slowing down start at $350 for a first offence. “We're just trying to be sage on the road, just like any other emergency vehicles on there, and we're just reminding the public to pay attention, slow down & move over, if they are able to,” said Nova Scotia RCMP spokeswoman Cpl. Lisa Croteau.